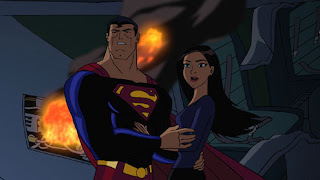 When the much admired Justice League Unlimited finally, and in many eyes prematurely, left our screens, there was a lack of adult-orientated DC animated content to chose from. As fun as Teen Titans is, it doesn’t exactly sit within standard continuity, and the Legion of Superheroes still has a distinctly child-like feel to it. 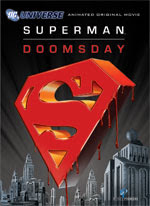 Fortunately the recent success of the live action cinematic endeavours has led to the formation of an animated movie initiative, and the debut feature, Superman: Doomsday, has just arrived on DVD. Based somewhat loosely on the death and return of Superman, the 75 minute movie chronicles Kal El’s demise at the hands of Doomsday, followed by his resurrection. As would be expected from a first in the franchise there are big names providing the vocal work, and even bigger fight scenes to accompany them. The story is a divergence from the original in a number of ways, first of all shoehorning Lex Luthor into proceedings as a far more central character than in the comic version. It is a archaeological dig commissioned by the chrome-domed despot that unearths the Hulk-on-crack Doomsday, who then promptly sets about destroying all in his path. In an uncommon move for animated comic features, characters do die on screen, including plenty of innocents at the hands of Doomsday. Some of the sound effects verged on OTT, but for the most part the palpable level of danger lifted the themes above the standard half-hour serial. After landing in Metropolis Doomsday tangles with Superman in a stereo shaking beat-down, which leaves both collapsed on the floor in the throes of death. At this point the story takes an even wilder twist on the comic series, compressing the various Super-clones into one, amoral look-a-like. Luthor is of course behind the entire escapade, mostly to fulfil his own fantasies of beating down Big Blue in a Kryptonite-fuelled fist fight. The conclusion is a Super-clone versus the original, complete with mullet and black suit, with yet again the kind of audio to make your neighbours bang on the walls. For the most part the animation stands up well, as it only slightly differs from the JLU style. 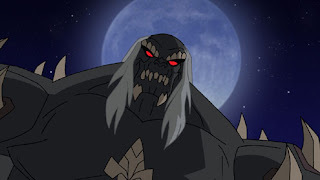 The exaggerated cleft chin on Superman does let the side down, but managing to capture the menace of a mute character like Doomsday is a superb achievement. The vocal work is provided by Firefly actor Adam Baldwin as Superman, Anne Heche as Lois Lane and Buffy favourite James Marsters as Lex Luthor. Baldwin carries the slightly detached but powerful tones of Superman, and even though his time in the Clark Kent guise is brief there is a clear difference. Heche, on the other hand, doesn’t seem to capture the sass and defiance of Lois Lane, often coming off as quite dull and banal. In the more emotive scenes she certainly improves, but the majority is a let down. Marsters is at his menacing best as Luthor, giving a deep, considered voice to the classic arch enemy without turning him into a moustache-twirling villain. There are a few, reasonably standard extras, including a comic-movie documentary and a look at the vocal actors. Most interesting of all is the look at the New Frontier, the next DC animated movie. In maintaining the look of the Darwyn Cooke classic while adding some top draw vocal talent such as David Boreanaz as Hal Jordan. I really enjoyed this although I have to agree with many others who were less than happy with the facial animation of the Man Of Steel!